What time is it you ask? Time to get a Fairway Clock - Laser Engraved to keep you punctual. 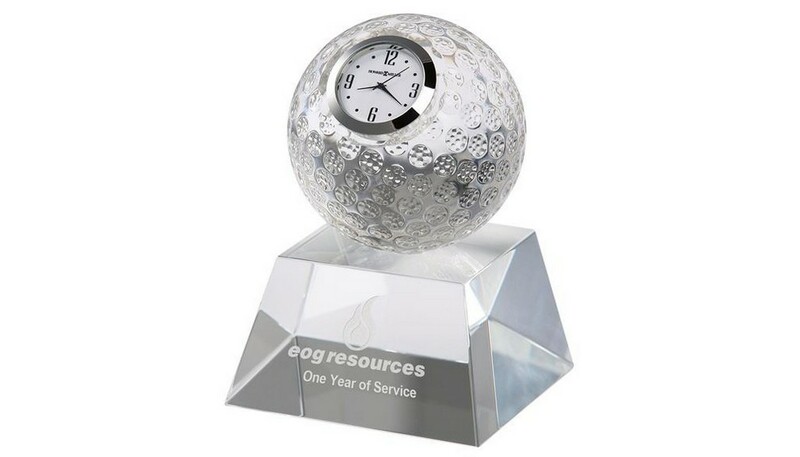 Prominently display your logo for years to come on this custom desk clock. Promote with perfection, promote with the Fairway clock! This clock is a great promotional item for special occasions, retail sales, sporting events, corporate advertising, and much more. It features a crystal golf ball that sits on top of a tapered crystal base. The white dial includes black Arabic numerals; black hands and hour markers; a glass crystal; and is surrounded by a polished, chrome finished bezel. This attractive crystal clock decorates your table and complements the decor of your home. This Fairway Clock is battery operated, powered by one SR626SW sized battery.